Let me let you in on a little secret. A secret ingredient that is. Pureed fruits, specifically applesauce, are often used as a fat replacement in baking— because baked goods are traditionally higher fat and calorie foods. But what happens when you do ANOTHER swap. Swapping the plain old applesauce for something like VEGETABLES. 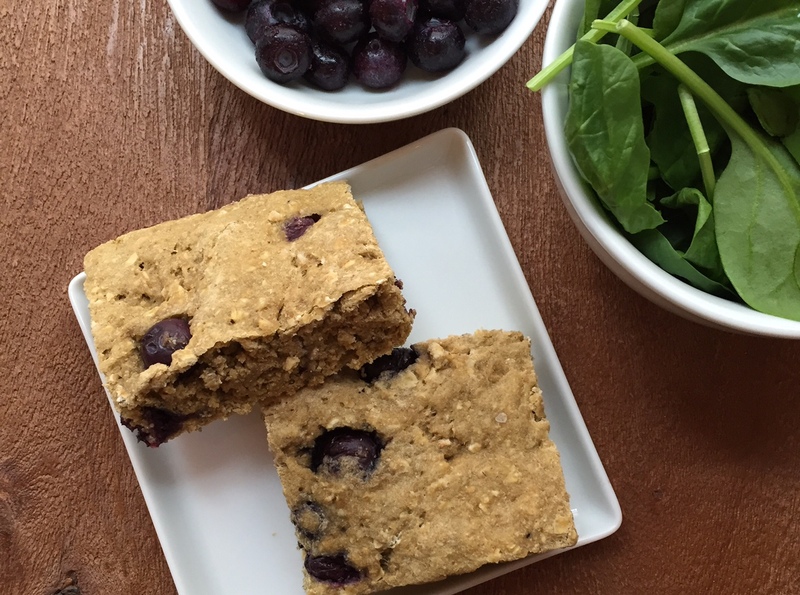 Can you guess what’s in these fruit and vegetable snack bars?! My friends at Happy Tot helped to inspire this recipe by sharing their newest products, the Love My Veggies pouches. These new pouches are available exclusively at Target stores, as part of Target’s Made to Matter program. What I love about Happy Family and their products is that they are realistic about feeding families. They GET what the mealtime struggle is like. Especially when it comes to veggies. Someone got ahold of the boxes! Ok back to the recipe. 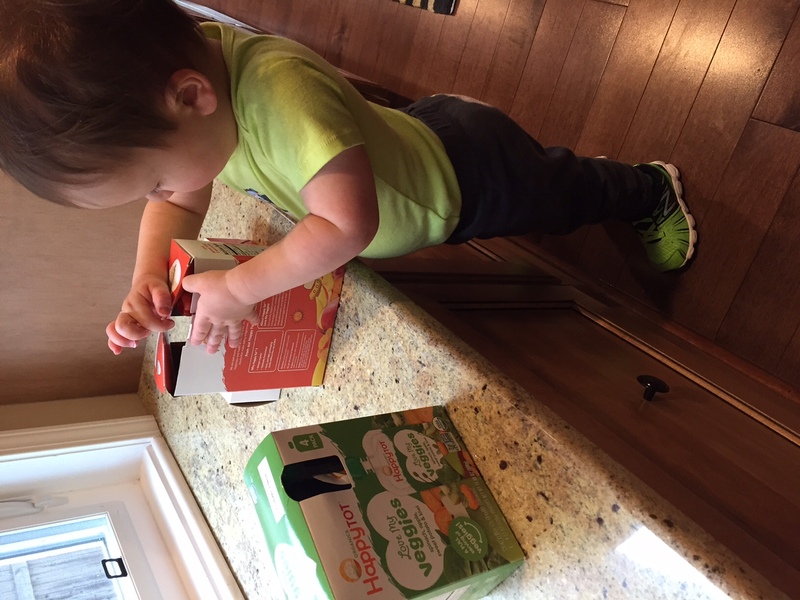 Now as you can see by the images in this post [and Instagram and Facebook—if you’ve been following me], Joey LOVES the new Love My Veggies pouches on their own. 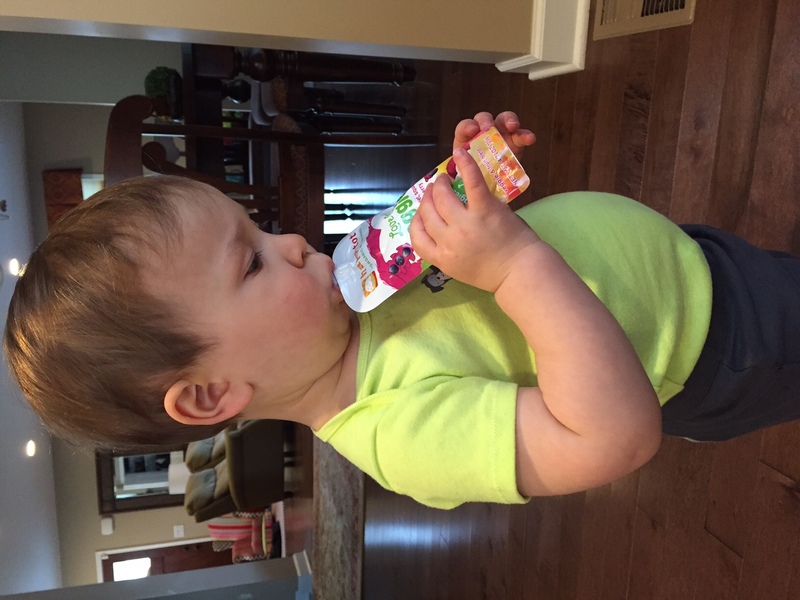 They are a staple in his diaper bag as they are perfect for on-the-go snacking. Last week we were on the road quite a bit [two-4 hour drives to be exact] so I wanted a snack that was hearty enough to keep his little belly full without having to make pitstops for food. The fruit and vegetable snack bars did just that! Forget the pouches… look at that baby belly! Preheat your oven to 350. Stir together the butter, veggie pouches, honey, and eggs. Stir in the oats and flour until well combined. Fold in the blueberries. Spread mixture into a 9x13 inch baking dish. Bake for 20-25 minutes until golden brown. Cut into bars. Serve immediately or store in an airtight container. Want to save this recipe for later? PIN it! Here’s another secret: Swap out any of the flavor pouches for a pouch you have on hand. Any flavor works great— think of the bars as a base! See what I did there? I just don’t want you to miss out on this awesome recipe… WHICH can be made with any of the Happy Family Happy Tot pouches. 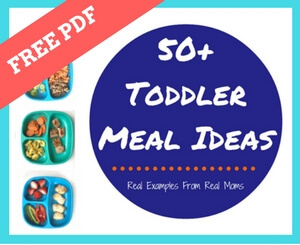 Your toddler will thank me! They were a hit in our house! 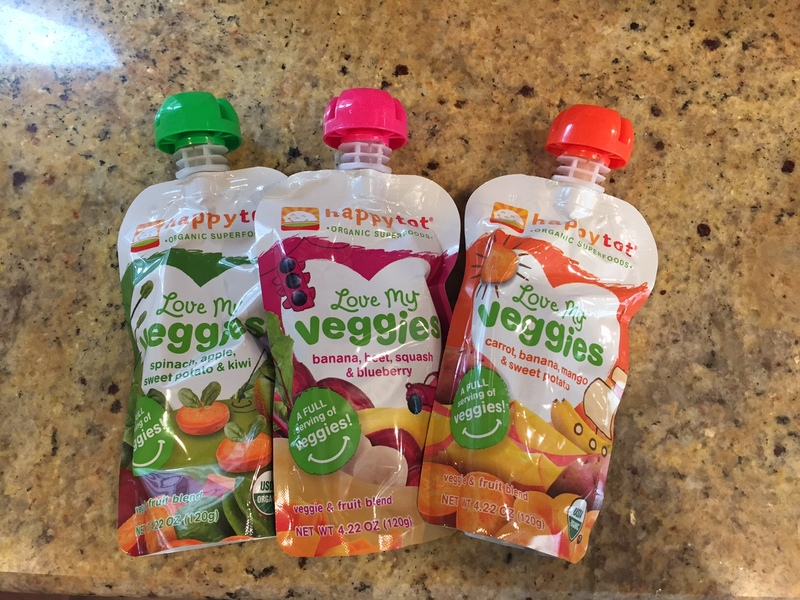 Such a great idea to use Love My Veggies pouches in these bars! It was a Eureka moment for me!!! Clever idea! 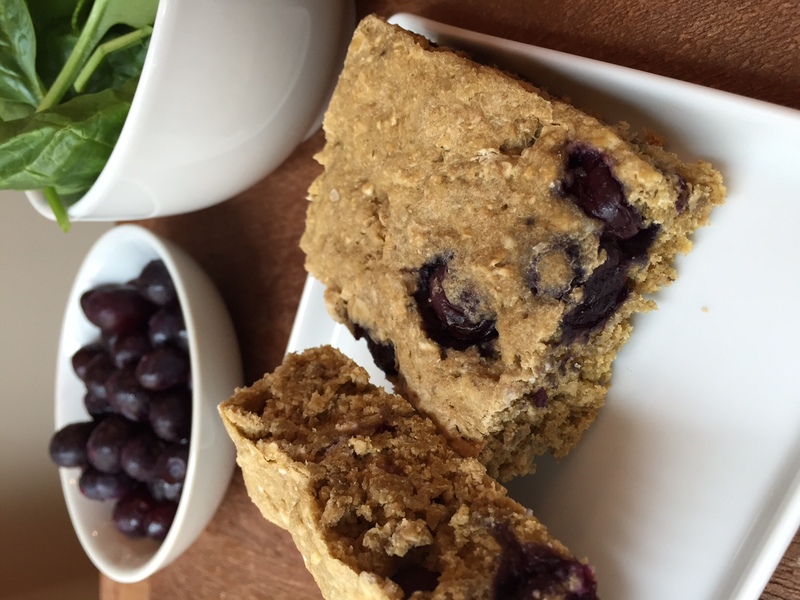 My kids are past baby food, but love the notion of working veggies into snack bars. Thank you! Great idea! 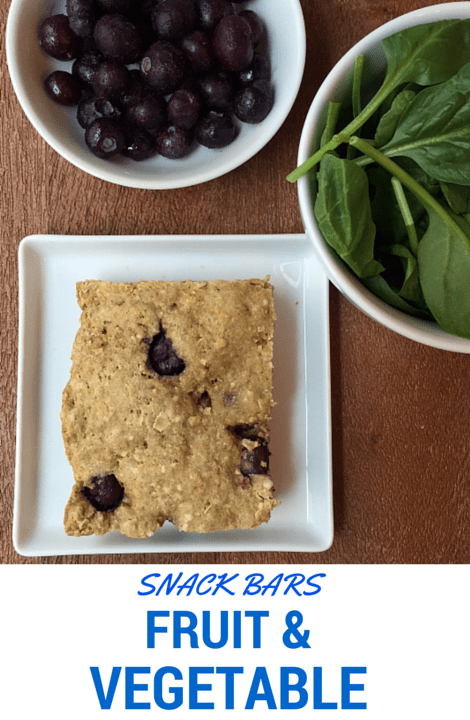 These bars look delish! Yes!! I’m always trying to find baked goods that pair as healthy treats too! My kids are teenagers so we have never tried these, how many ounces of pureed fruit/veggies could I replace these with? Sorry for the delay. 1 cup fruit purée would work!